It looks like it's that time of the month again. The UFC has announced another round of cuts to it's roster. Below is a list of the 14 fighters who have received their pink slips from the promotion. 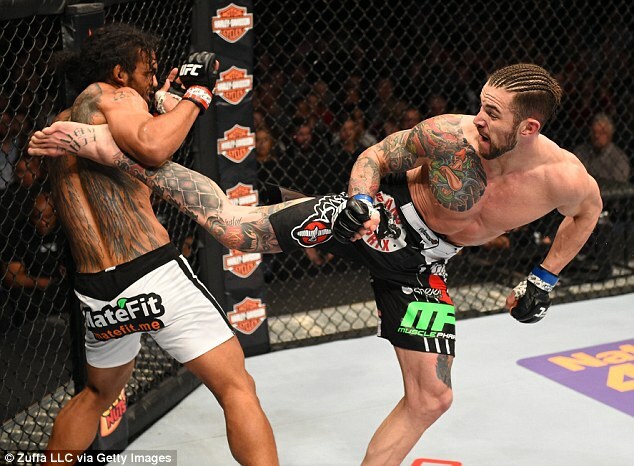 Brandon Thatch came into the promotion as one of the hottest prospects the welterweight division had to offer. After his two impressive first round finishes, he appeared to be living up to his hype. After a long layoff through injury, he was set to headline an event against top contender Stephen Thompson. Thompson pulled out due to an injury of his own, to be replaced by former lightweight champion Benson Henderson. Thatch lost that bout via 4th round submission. The loss marked the start of the end. That fight was the beginning of the 4 fight losing streak that ultimately led to his release. All four losses came by the way of submission. Thatch is an excellent striker.But when you are at the highest level of competition, you have to be an all around mixed martial artist in order to have success. News of Jingliang being cut came as a surprise to many, especially as he's one of the few on the list that isn't on a losing streak. He later provided clarification through his twitter account. Jingliang advised he is officially a free agent. He also stated he is currently renegotiating with the UFC in order to get a new contract. Dalby came into the promotion with a ton of hype and had an undefeated 13-0 record when he made his UFC debut. After winning his debut by split decision, he had a fight of the night war against a very tough fighter in Darren Till that resulted in a draw. Since that fight, he has lost his next two bouts and that is all it's take for him to be cut from the roster. If Dalby can bounce back by picking up a few wins in other promotions, it would seem likely he can get another chance to compete for the UFC. Pesta was 1-4 during his stint with the UFC. His current losing streak includes him being on the wrong side of three devastating finishes. Most recently he lost to Alexey Oleynik via an extremely rare ezekiel choke, a submission that had never been pulled off in the UFC. It seemed that Pesta just wasn't experienced enough to fight at such a high level. At only 26 years old, he may get another shot at the big show if he can be successful on the regional circuit. Letourneau made her debut in 2014 and won 3 consecutive fights in a row before getting a shot at the current champion Joanna Jedrzejczyk and losing a unanimous decision. Since the loss to the champ she has suffered back to back finishes and has come out and stated that the weight cut to 115 pounds was just way to much for her to do. Letourneau would be a great addition to Invicta's 125 pound division and possibly if a 125 pound division is added to the UFC, we can see a return from the Canadian. Faszholz didn't have much success in the UFC, going 0-2 with a short lived run. The highlight of her brief time with the promotion; was undoubtedly a fight of the night bonus in her debut against Lauren Murphy. With the news of her cut being confirmed, it was announced shortly afterwards that she has picked up by Invicta. Jones Lybarger went 0-3 in the UFC and after her most recent loss to Nina Ansaroff she had decided that it was time to hang up the gloves and call it a career.